We have 2 more days to hunt here in Virginia, and my friends Jack and Cecil are hunting hard, with our eyes on two bucks that have eluded us all season. If you’re still hunting into January too, try these 5 tips. Get the wind perfect: Back in October and especially during the November rut you predicted but never really knew from which direction a buck would come. So sometimes you cheated and hunted a stand on a couple different winds, and that worked out okay. But now there is only one good wind and little margin for error. In the evenings, deer move straight from their beds to a harvested cornfield or soybean field–anywhere they can find last scraps of food. When you hunt there, the wind can’t blow back toward a bedding cover, and it can’t swirl out into a field where the does will pop out first. Set up downwind of a trail or funnel where your scent will blow back into a dead zone in the timber where no deer will hopefully come out. If just one doe winds you and starts blowing, you won’t see a buck that night. Go for perfect access: With deer stressed and wired in winter, access to your stand is critical. Try to slip into and out of a spot without a single deer seeing you. If you can’t use something like a ditch or creek bank to cover your moves, don’t risk it. If you bump one doe you’ll spook a bunch of deer. They’ll blow out of the area and they’ll probably change their pattern. Sneak to your stand early in the afternoon—at least 3 hours before dark—so no deer will spot you. Track a buck: Late in the morning, if you cut a big, fresh track in snow, follow it awhile. If you see by the buck’s stride that he is slowing down, stop, wait and glass hard. Check as far as you can out front, and 100 yards off to each side of the trail, since the buck might have fish-hooked. Snow on the ground helps you spot deer. Watch fringes: Watch the fringes of pine, cedar or honeysuckle thickets. Bucks love to run those green edges between bedding and feeding areas, moving along the strips where they feel some security. Play off the pressure: The last couple days of the season, you might hear people making a last-ditch drive on an adjacent farm or woods. If so, hike up a ridge or hill and watch thickets on your side of the fence (stay well inside your property and be extra careful where you aim and shoot). There is good chance some does and maybe a buck spooked by those hunters might jump the fence and come flagging your way. Imagine the look on those guys’ faces when your gun cracks and you score at the buzzer! If you’ve still got a buck tag in your pocket, read on. One recent winter in North Dakota was atypical, as it has been in many parts of the county these last few years. With only 2 nights left in the 2011 season, Derek decided to change it up. He moved to an entirely new location within the ghost buck’s core area, and set up in a hidden spot that nobody had hunted all season. He didn’t hang a tree stand, but rather fashioned a small ground blind behind a fallen tree. The first deer to step out that evening was the giant! He moved slowly toward Derek, bronze antlers glinting in the last light. On the ground Derek had to be especially stealthy, and he was. 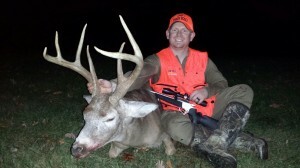 When the deer crossed at 30 yards, he pulled his Hoyt and let the arrow fly. The buck kicked and ran, but didn’t go far. I point out two major keys to Derek’s success, and I urge you to keep them in mind. 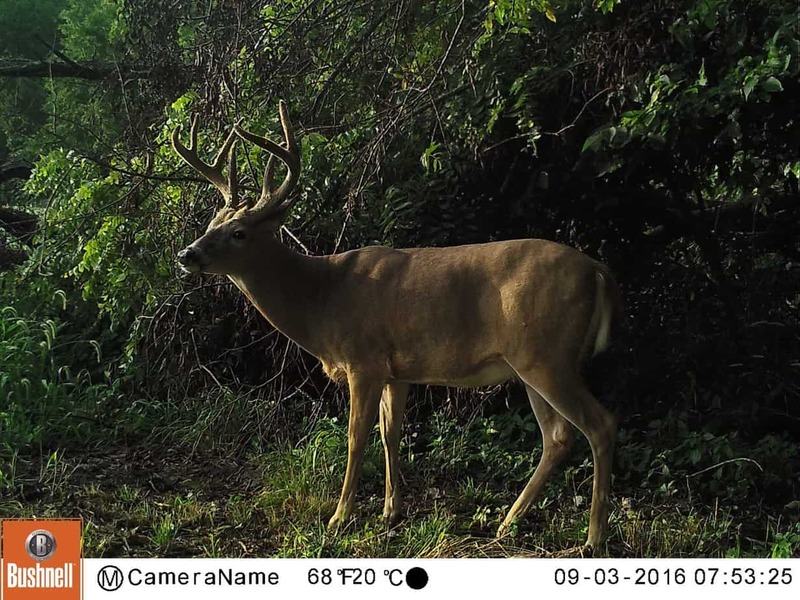 One, if you use trail cameras, keep them running until the last day, you never know when and where a buck you have never seen before might show up. Secondly, and this is huge, hunt the buck’s winter core area, but switch it up. Vary your normal approach into the woods each day…set up, either in a stand on the ground, in a funnel or near a cover edge… That buck is there because he is a master of moving around and avoiding hunters. Get that element of surprise and you might get him yet. 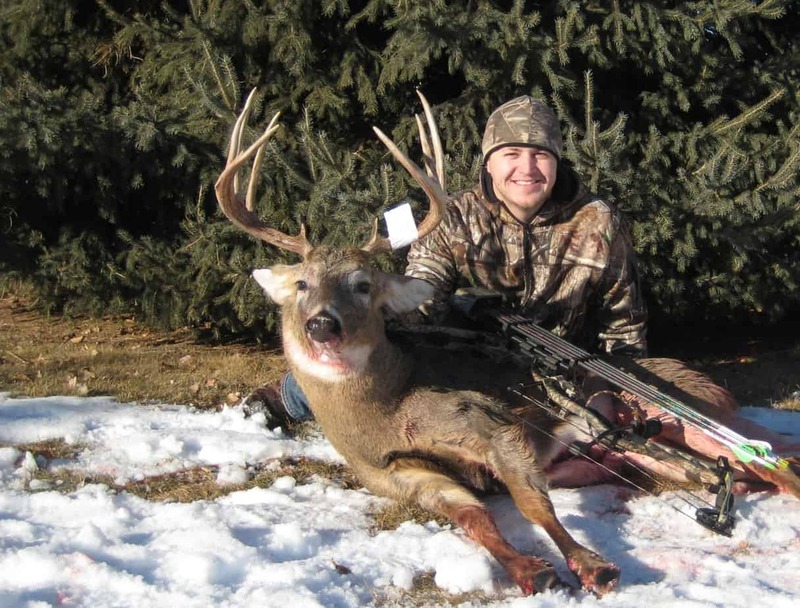 Your late-season strategy has to center around the limited foods that remain for the deer. Both does and bucks are run down from the November rut, and they have to eat. The colder (and snowier) it is in December, the harder deer will move to and from the leftover feed, and the more visible they will be in daylight. Crops: You’ll see the most animals if you have access to corn or soybeans, by far the two best winter food sources. A patch of standing corn is especially good, as it provides both eats and cover for skittish deer. In a harvested bean field, scout edges and corners where a few strips of beans were missed and still stand. Those will be a magnet for deer. The less gun pressure in and around a field so far, the more bucks you will see in daylight. Pray for snow and temps from the teens to 30. A hungry buck might pop out into the crops morning, noon or night then. Bundle up and be out there till the endRidge: I love to hunt a hardwood ridge within a mile of a crop field anytime of season, but not any old ridge will do in December. Ideally, look for a hogback that was thinned a few years ago and that now offers brushy ground cover. A lot of does and bucks will travel through the second-growth saplings and thickets en route to and from the fields, and they’ll stage and browse in the greenery, and on any leftover acorns. 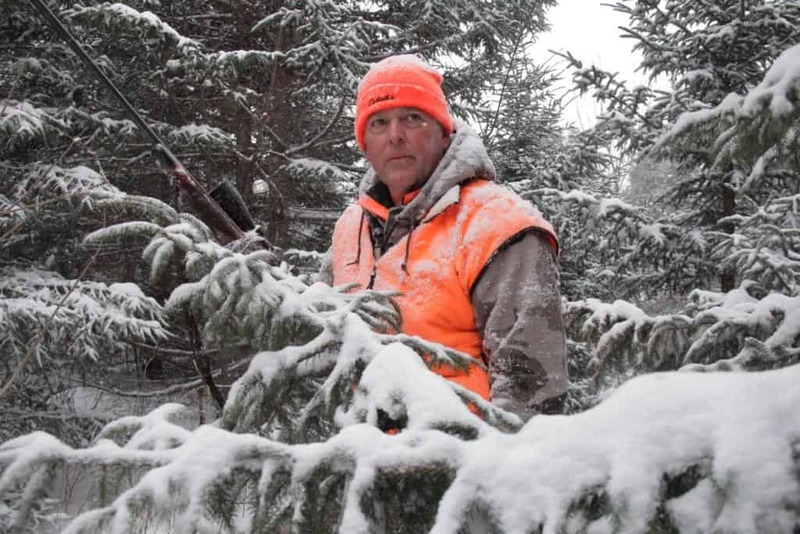 Tip: Sneak in somewhere through mature, open woods and set a stand or blind on the first downwind edge of where the thinned second-growth begins. You shouldn’t jump a single deer. Thickets: If you hunt public or private woods miles from the nearest corn or beans you won’t see nearly as many deer—none some days. To have a prayer of punching that last tag you must find and watch what little food/cover mix is left for a buck—edge of a clear-cut or power line, oak flat near a cedar swamp (maybe a few nuts), grape or honeysuckle thicket…you get the picture. Set a stand on the fringe of a pine, cedar or honeysuckle thicket. Bucks love to run any green edge left in the woods. 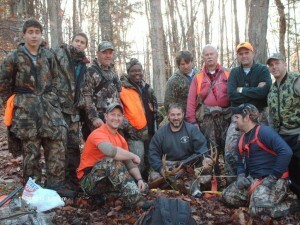 Virtually every farm or woods has had some hunting pressure, moderate to heavy, come December. Don’t fret about that pressure, but rather factor it into your strategy and use it to your advantage. Numerous studies have shown that almost all people hunt within a mile of a field, logging road or similar easy-access area. In late season, the answer is neither to keep hunting these same spots, nor or it is to necessarily go deeper into the woods away from roads. Studies also show that most whitetails do not flee pressure by leaving their core areas and heading miles farther into cover. Rather, most bucks continue to live around the same fields and ridges, they just seek out hidden, thick spots where most people never hunt. And they move at night. That is why switching it up where you hunt is so important in winter. Think “out of the way.” A beaver swamp beside a gravel road, a 6-acre thicket behind a neighbor’s house, an overgrown hog lot back of a barn… a thick spot like that is where an old 8- or 10-pointer will hide in hopes of riding out the season. Find such a spot, set a stand (ground or tree perch), hunt it hard and score at the bitter end. What About the Second Rut? –Lay a doe-in-heat trail into your stand most days. Far fewer does mist the woods with estrus scent now; a buck might cut your trail and follow it in, hoping to hook up with a last hottie. –Carry your grunter and continue to call. If you see a flurry of rutting activity in early December, you might try rattling to mimic two bucks fighting over a last hot doe. But if and when the deer you see appear secretive and skittish, indicating the rut is done, back off because bucks will shy from the horns rather than come to the racket. In most regions right now, most of the adult does have been bred, and bucks are tired and run down from chasing, breeding and eluding hunters. But those survivors know the chance to breed a doe won’t come around for another year. They prowl for the last five percent or so of does that might still be receptive. They move heavily at night and in cover, but a good buck might slip up at dawn or dusk, so be out there. The days of Thanksgiving weekend are some of the biggest hunting days of the year as family and friends get together and fan out across the woods. This is another reason to hunt. You never know where and when that pressure might drive a buck into your lap. Best conditions: Hope for daytime highs in the 30s to low 50s, with lows in the 20s. I prefer clear high-pressure days, but a light snow would be great. 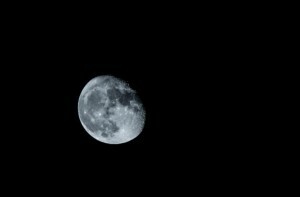 One thing in your favor is the last-quarter moon this week. Researchers have found this moon phase to be best for extreme deer movement, especially the last hour of the day. Top stand: You’ll likely have a chilly west or north wind, so set up on the east side of a hill or ridge where the wind is right, and where you can cover a wide swath of thick woods, marsh and/or a weed-choked field. Watch for a buck cutting from one thicket to the next, hoping to run across a last hot doe—or sneaking from pressure. Remember the last hour of the day is likely to be best. Mike: Finally caught up to this 6 ½-year-old buck this weekend. 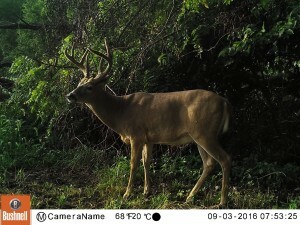 I have four years of trail camera history with this buck, and this marks the first time I ever laid eyes on him. He would spend his summers on one end of our farm, and disappear the first week of September. Each of the last few seasons, I would assume he was dead, and then he would show back up in May. He wasn’t really on my radar much during the last few hunting seasons because of this, and because I was chasing the giant freak the last couple years. I shot him on the complete opposite end of the farm, about a mile from where I had the last trail cam image of him back in September. He has switched back and forth between a 6pt and 7pt the last few years, and has added some mass, but he looks relatively the same. Agree Zach, no better trophy than a 6 year old whitetail buck, when they grow that old they turn into an entirely different animal—nocturnal, secretive, ghost-like. Way to go man and thanks for sharing. Look at those brows! The full moon now is not only the closest and brightest “supermoon” of 2016, but it’s also the largest since 1948. Check it out tonight because a full moon won’t come this close to Earth again until Nov. 25, 2034. I don’t know if the closeness and brightness of this moon will make the whitetails rut any harder than normal, but I do believe this full-moon rut week will be a good time to kill a big deer. If you have read my blogs and watched my BIG DEER TV show, you know I’ve been working on a new theory: that mature bucks move great during the day in and around any full moon in early to mid-November. This flies in the face of what many of you have read and been taught for years–that deer are most active at night during a big moon, and therefore move less in daylight, and thusly the full moon is bad for hunting. But I believe I’m on to something, because the more I hunt during the rutting moon across the U.S. and Canada, the more mature bucks I seem to see wandering around the woods, or chasing does. I am not a scientist so I can’t give you any hard data to that end, I just know from more than 30 years of hunting experience the full moon in November is great for rut action. Marcus Lashley is a scientist, and his findings on the full moon back me up, at least somewhat. “A common misconception is that deer can see better at night (and hence move all over the place) because it’s brighter when the moon is full. But according to our data they actually move less on average at night during a full moon and more during the middle of the day, and also earlier in the evenings,” he says. I see things setting up to be pretty darn good this week. Many of the old bucks will be coming out of lockdown around then, and as they go back on the prowl for more does, some of them will move long and hard from around 11:00 a.m. until dark each day. Plan to get on stand early and hunting hunt till dark if you can hack it. STAND ONE: There is no better spot for your stand than on an elevated ridge near a field of beans or corn. A ridge is staging area near the doe feed and a hub of buck traffic. Both local and vagabond bucks cruise the ridge, rubbing, scraping and sniffing out does. Some of this activity will occur at night, but some big deer start to move earlier in the evenings, and linger after sunup this week. 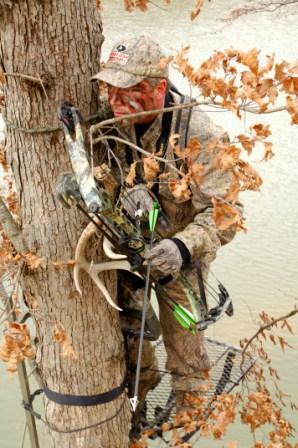 Set your stand on a corner or edge of the ridge where the access and predominant wind are best. There’s a good chance you’ll see at least one good buck and maybe more. STAND TWO: Having been hassled by bucks for days some does sneak out into CRP fields, overgrown pastures, thick cedar ditches and other out-of-the-way spots where the boys cannot so easily chase them anymore. Also, a mature buck knows when a doe is on the verge of standing for him. He’ll herd her out in the same type of cover, pin her down and stand guard for 36 hours or so, until he finally gets his way with her. With that in mind, set a stand to overlook a weedy habitat where you can glass 100 yards or farther into the brush for breeding deer or loner bucks prowling for a doe. If bowhunting, hang your perch for a 30-yard shot along a deer trail that comes out of the woods to the weeds, or on a fence line, gap gate or similar funnel. STAND THREE: Set a stand where a series of thin ridges, flats, shallow draws and a winding creek come together. This spot is a dumping ground for deer throughout the rut. Sneak in and sit all day. Morning or afternoon, you might spot an 8-pointer trolling on a finger ridge, nose to the ground…or a 10-pointer trotting down a hollow…or a doe running with 3 bucks on her heels…. Keep an eye on that creek and the cover around it because deer will travel up, down and across it all rut. Hunt this stand for 10 or more days this November, and I can almost guarantee you’ll see at least one shooter and likely more. Good luck let me know how you do.